No child wants to grow up and become a refugee, and no country in the world, without immediate reason, is going to help foreigners who don’t feel safe in their own country. Then suddenly things get out of hand and refugee camps spring up near conflict zones all over the world, just as they did in Nunspeet and Ede in the Netherlands during the First World War, when a million Belgians sought a safe haven. 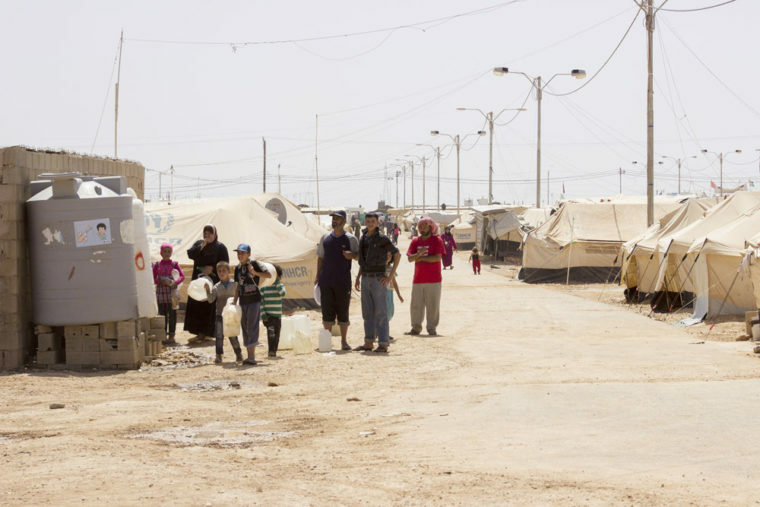 Refugee camps thrive on mutual dependence. Especially at the start, their inhabitants have no idea what the future holds in store for them, and they find themselves at the mercy of humanitarian organizations that are funded to provide initial relief in a hornet’s nest of conflicting political interests. For that is their livelihood. But camps sometimes become cities, with an economy of their own and sovereign inhabitants, who do not need emergency help as such, but rather shops, schools, hospitals, restaurants. All that is required, then, is some supervision to prevent the place turning into a slum. That insight is slowly starting to gain acceptance. Visit, by way of introduction, the wonderful interactive map that Jan Rothuizen made of Camp Domiz in the Kurdish region of Iraq . The biggest refugee camp, Dadaab in Kenya, is home to almost 330,000 inhabitants and is twenty years old. The average length of time that people spend in a camp is 17 years. That’s the cold reality that the parties involved would rather ignore. 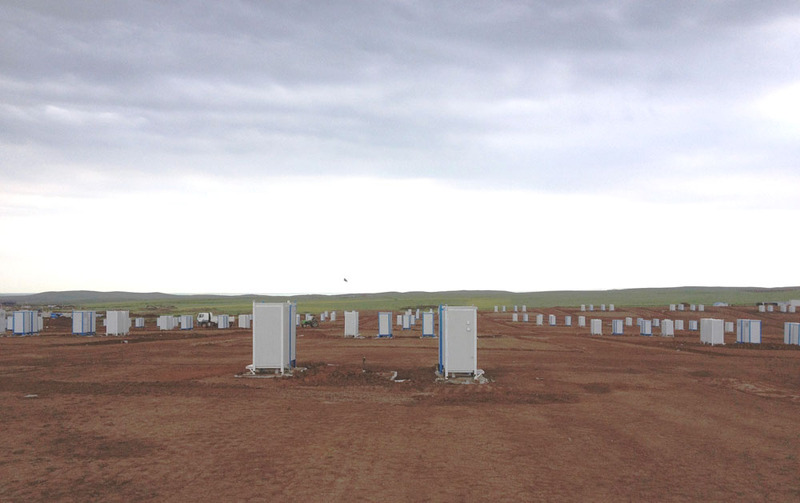 A camp, a city by stealth, is set up as a temporary settlement, the consequence of which is that refugees have to make a disproportionate effort to extricate themselves from the clutches of emergency aid and regain control of their lives. During the second anniversary of De Correspondent, on 10 October in Felix Meritis, the chairperson of the Netherlands Refugee Foundation, Femke Halsema, sketched a picture of the unprecedentedly hysterical public perception of the arrival of refugees in Europe. In addition, as a frequent visitor to camps, she made an impressive appeal to any designers in the audience to come up with solutions for the often unavoidable urbanization of camps, a process stalled by, among other things, insufficient recognition of refugees as independent people. As a cog in the machinery of design, and intrigued by the paradox of designing autonomy for people while establishing a city where they have already been living for years, I felt compelled to do something. I myself am not in a position to contribute to practical solutions, but what I can do is poke around and help to draw attention to the subject. So first I phoned Alexander Vollebregt of the Faculty of Architecture at TU Delft. I knew he had developed urban design expertise concerning effective relief for people after major catastrophes, in his case mostly natural disasters such as the Haiti earthquake of 2010, and I’d met him previously. It turned out that a year ago, after twenty years of valuable and lauded research, he had thrown the towel into the ring. Extremely rankled by the inflexible way emergency relief is organized, he speaks of a Catch 22 situation. With armed conflicts you are mostly dealing with the UNHCR (United Nations High Commissioner for Refugees), which must operate under highly complicated political conditions and therefore focuses on the technical side of relief under diplomatic protection. In addition, there are various implementing bodies such as Cordaid that are funded through charity, and that money is, accordingly, exclusively intended for relief aid, and not for researching how best to provide it. Development is simply not allowed. Universities do conduct research, but in dribs and drabs. For no money is allocated for the development of knowledge that produces nothing. Vollebregt sees no possibility for learning and improving within the current system, and he quotes Richard Buckminster Fuller: “You never change things by fighting the existing reality. To change something, build a new model that makes the existing model obsolete”. Have a good cry and start again. The picture presented is similar to one of the two ARCAM presentations that I attended on 22 October, this one by New York office Ennead Architects about their Ennead Lab. They were commissioned by Stanford University and UNHCR to develop a plan for the design of refugee camps that could be applied all over the world. That was tackled expeditiously, with a preliminary study into soil conditions, the charting of spatial possibilities, available materials, and everything you’ve always come to expect from spatial designers. But one detail was missing: residents, social connections. In a word: people. You do of course have to determine what is needed in terms of material things, but you also have to be ready in social terms. Perhaps you have to set up a human resources department where people, upon arrival, can apply for all sorts of commercial and municipal positions, and of course for the position of Head of Human Resources, all of this to gain a sense of personal responsibility as soon as possible. Thoughts along these lines are not unique. Based on what I’ve learned as a brilliant armchair quarterback, I can’t help thinking that people whose lives have been molested start to understand the chances of emancipation. They are increasingly taken seriously. How well that can work is made clear by the graduation project by Manon van Hoeckel this year at Design Academy Eindhoven. On account of the scale, you could call it a laboratory study, and only indirectly does it have to do with refugee camps. But it does address the right to self-determination. Spontaneous curiosity drove her to seek out asylum seekers who have exhausted all legal channels, simply because she had never seen one. Through conversations with them she learned that no embassy represents them. They are not allowed to stay here, and they are not welcome in their home country. So what could be smarter than setting up just such an embassy: ‘In Limbo Embassy’ (inlimboembassy.org) made from a builders’ hut, with the outcasts themselves as official ambassadors. They are also pictured by photographer Alexander Popelier with a proper sense of dignity. The photographs are on sale, and for the ambassadors that’s a way of making a little money. They also print banknotes, which are also for sale, thanks to the law that guarantees freedom of expression. She has helped a group of people discover the road to sovereignty. Dignity and self-determination are more important than any form of humanitarian aid. The importance of personal involvement was also clear during the ARCAM evening. Eliza Montgomery and Don Weinreich of Ennead Architects didn’t have an easy time with the questions from the audience. Their presentation did touch on the issue of sustainability in the technical sense of reusing materials, but not in the banal sense of lasting use by people of flesh and blood. Someone else wanted to know why there were no trees. That turned out to be impossible because a tree symbolizes possession, and possession is definitely out of the question. 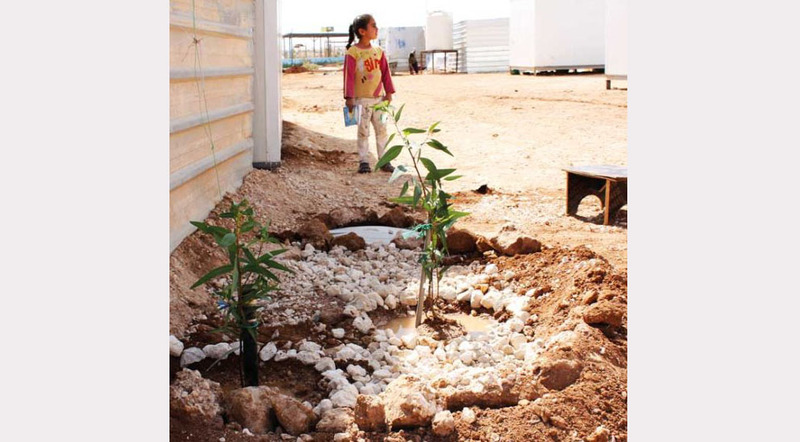 Even so, some planting was possible, as demonstrated by the graduation project by Robert Kruijt of Wageningen University, also set in the Zaatari Camp. He was involved in the Amsterdam project and organized workshops with refugees, completely counter to the customary top-down mores. He let them use Photoshop to alter photos of the camp as a way of finding out what is most lacking. Topping the list were open sewers and the lack of greenery. Kruijt saw a solution in separating black water (faeces) and grey water (the rest). The former goes to storage tanks and the latter is used to irrigate soil for plants. While those plants may not be edible, a little greenery is a huge relief in a life full of uncertainty. And so, far away from the asylum hierarchy, you do spot some green shoots, some initiatives that offer a more dignified view of refugees as independent individuals, even if it is only in one camp. But refugees can talk and they have smartphones, just like everybody else. That is the basis for a strategy for their collective housing. You cannot dictate cities, but you can give them air. Ed van Hinte studied industrial design at Delft University of Technology before founding Lightness Studio. Terwijl de burgeroorlog in Syrië en de vluchtelingenstroom voortduurt, zoekt de wereld naar oplossingen. Tegenlicht volgt VN-gezant Sigrid Kaag.